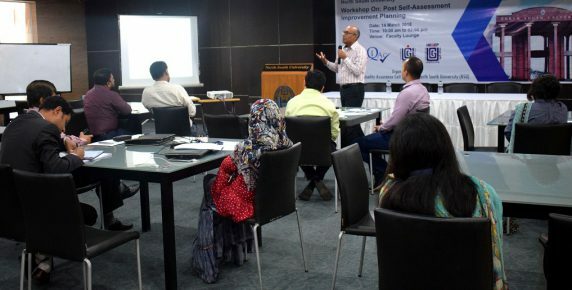 A day–long workshop on “Post Self- Assessment Improvement Plan” was organized for the Self-Assessment Committee (SAC) members by Institutional Quality Assurance Cell (IQAC) of North South University (NSU) on Wednesday, March 14, 2018 at the Faculty Lounge of NSU. The program began with a welcome address by the Director of IQAC Dr. Nazmun Nahar, P.Eng. Dr. Ahmed Tazmeen, Quality Assurance Specialist, QAU, UGC facilitated the workshop. In his presentation, Dr. Tazmeen discussed what Post Self-Assessment Improvement Plan (PSAIP) is and how it can be developed and documented. He shared a sample annual action plan with the participants. Twenty three SAC members participated in the workshop. Towards the end of the session, SAC members were asked to prepare an annual action plan of their respective departments and present them.